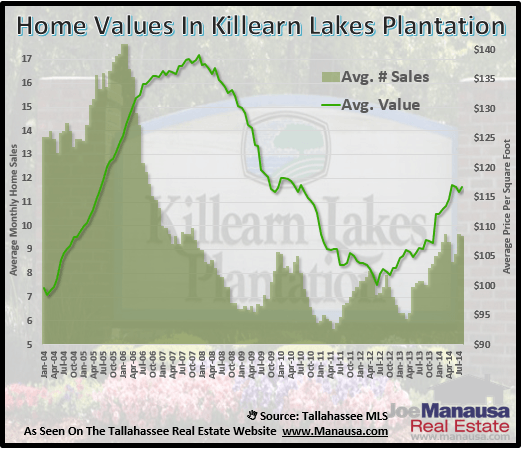 The number of home sales closing each month in Killearn Lakes Plantation has remained near a 6+ year rise, with both home values and home prices strengthening in conjunction with the housing market recovery. Thus far in 2014, there have been 80 homes sold in Killearn Lakes, with an average sales price of $199,000 and a value of $113 per square foot. That means you are getting a 1,758 square foot home for just under 200K in a highly desirable NE Tallahassee neighborhood. Currently, there are 92 homes for sale in Killearn Lakes (17 of which are already under contract), meaning that buyers have a better selection of homes to choose as roughly 4 of every 5 are definitely available. 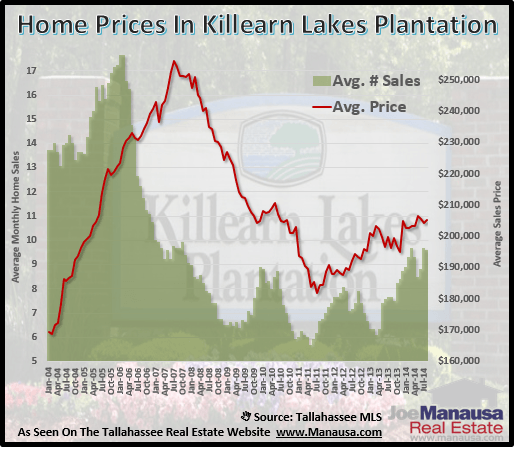 After hitting a market low below six home sales per month back in 2011, Killearn Lakes has recently recorded an average of roughly 10 home sales per month, which is better than anything we've seen since the latter part of 2007. Home values have leveled off after a rapid rise from the bottom in the summer of 2012. Distressed properties sales have declined somewhat, allowing arms length homes to gain more traction in the market. Home prices continue to recover from a bottom found in the Summer of 2011, though they have bounced around a bit since January of 2013. Currently the average arms length sales price of a home in Killearn Lakes is around $220,000, while the distressed homes have sold for an average of $157,000. That is quite a sizable difference between arms length and distressed, and the valuations show pretty much the same, with arms length home values averaging $123 per square foot, while distressed home values are coming in around $95 per square foot.